You need to build your email list if you want to grow your blog. Don’t be the person that keeps making excuses for why they aren’t focusing on building their list. I learned that lesson the hard way but you don’t have to. The truth is that email is far more effective at reaching your raving fans than any other tool. The challenge has always been figuring out exactly what to do in order to grow your email list faster. We all want more subscribers don’t we? 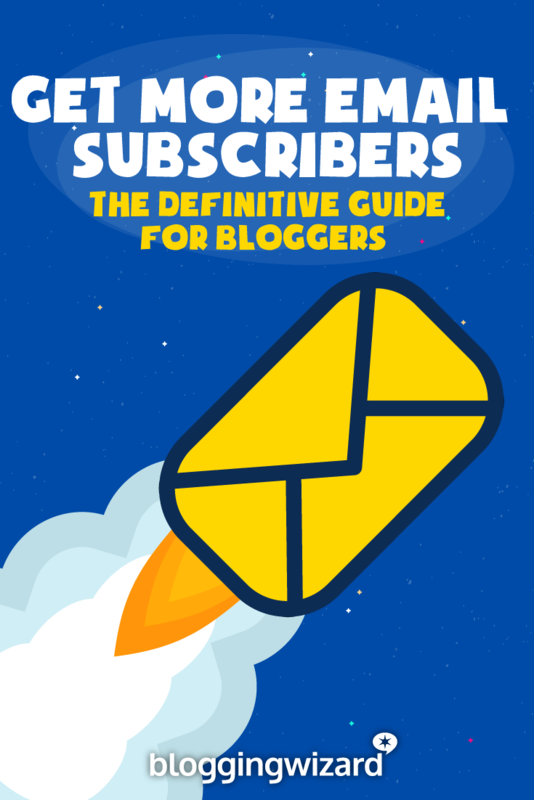 In this detailed guide you will find a step-by-step blueprint for rapid subscriber growth. You will learn what setup work to do, which tactics to use and what you need to test to build your email list. Are you ready to get serious about building your email list? 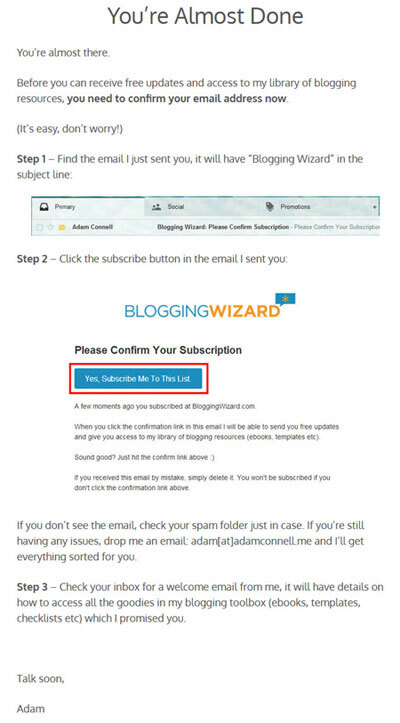 Blogging Wizard subscribers get access to exclusive guides, templates and checklists not found on the blog (including our list building checklist that goes along side this post). Before we dive into the meat of this hugely insane post we need to cover a few important things. Whichever tactics you use to build your list, you need to make things extremely simple. If you turn the process of signing up to your list into a long winded process, people won’t subscribe. However you decide to entice people to subscribe to your email list, you need to keep your offer hyper relevant to your target audience. Consider their motivations, their desires and what they want to learn from you for example. Click on the links below to navigate to the relevant section. Before we dive into getting setup, there is some prep work that needs to be done even before you start diving into your mailing list provider. This will make things far easier for you later on. It’s not enough to just build your list, you need to know what you want to accomplish at the end of it. Your end goal should guide the decisions you make and how you prioritize the tactics you implement. For example, if you just want to use your list to build a community and get more people to check out your new posts – that’s great. Or you may want to setup a sales funnel to help you sell products on auto pilot while you send out the odd broadcasts to share awesome content with your subscribers. Being clear on what you want to achieve will help you achieve it. When you give your readers an incentive, they will be more likely to sign up to your list. Perceived value is the key here – the higher the perceived value is the more likely people will be to subscribe. So the question is what do you create for an opt-in bribe? Well, you don’t have to worry about creating a long winded eBook (unless you want to). Creating a one page PDF checklist or list of tools can often be even more effective because people love things that make their life easier. If you offer a product/service, you could also try offering a discount or a free trial. This could be a great option to use. Also consider how you will deliver the opt-in bribe to your subscribers, I host mine on Google Docs because it is reliable and doesn’t impact the load times of my server. While this does make some things more straight forward, it’s not so mobile friendly so I’ll be changing this soon. I use LeadPages* to power a lot of my landing pages, but it also has the option to send your opt-in bribes directly to your email list subscribers. Note: for more help on lead magnets, including the delivery of them – check out my detailed guide to lead magnets. Creating a single opt-in bribe is great, but if you give your subscribers something they weren’t expecting, you will really make them feel valued. You don’t have to do this, but it can have an incredible impact on subscriber loyalty. There will be some content that you will need to get ready for when you setup your email provider later on. Welcome email – make this as engaging as possible and let your subscribers know what to expect. If you’ve got an opt-in bribe for them, you can include it here. Auto responder sequence – consider your goals here; this can be a great opportunity to grow your passive income, but avoid the hard sell approach. Nobody likes to sign up to an email list only to be battered with promotional emails. You need to get your email provider setup right to ensure you’re list building efforts get off to a great start. Let’s take a look at what you need to do. If you’re relying on something like Feedburner to deliver your emails you need to drop it and switch over to a serious email provider. AWeber, MailChimp and GetResponse are also solid options that are both very popular; check out David’s detailed comparison review here. Mailerlite* offers a fully featured free plan for up to 1,000 subscribers and Drip* offers a free plan for up to 100 subscribers. Mailerlite is great for simplicity and Drip is best if you need advanced automation. It’s straight forward in all platforms and each email provider has documentation to help you. For example, in MailChimp you would head to ‘Lists’ and click the ‘Create List’ button in the top right corner. Active Campaign has a ‘Create a List’ button the account overview – I quite like the step-by-step setup process they have, which makes setup straight forward. Each email provider will require this to be setup, but I wanted to mention it here because how you setup these settings is important. Sender email address – I’ve seen a lot of people and brands send emails using a ‘no reply’ email address, this can make engaging with your subscribers very difficult. Use an email address where replies are monitored, it will give you a great opportunity to engage your loyal subscribers and get feedback. Use a recognizable sender name – If your subscribers don’t recognize who is sending the email, they might not open it. Use something that is easy to recognize, this may be your name or your brand name – whatever people are more likely to recognize. It’s time to get your welcome email loaded in with your auto responder content. With most email marketing tools a welcome email will be part of your auto responder, but if you are using MailChimp, you could customize the ‘Final welcome email’ which is what subscribers are sent straight after they sign up. 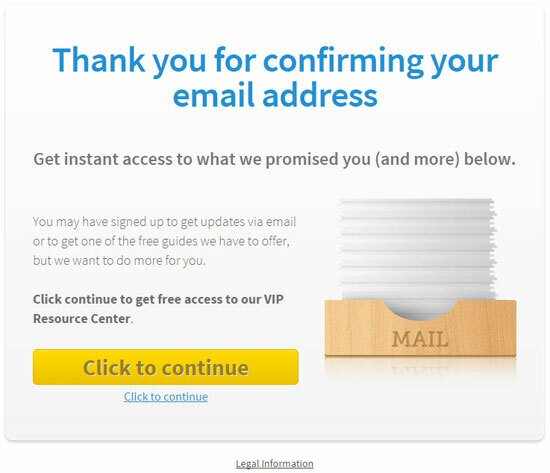 You can add this by going to Lists > Sign up forms > General forms > Click the drop down and select ‘Final welcome email’. I wanted to mention MailChimp specifically because the welcome email setup is different to most providers. Now it’s time to add your auto responder content but be careful about the time frame in which you schedule these to go out – nobody likes to be bombarded too often. Creating a custom thank you page is an important step to take because it is a perfect opportunity to ensure that your subscribers get instructions on what to do next. Let’s people know they have to confirm their email to get access. Step by step process – makes this really simple. Includes images so people know what to expect. Mentions what to do if people can’t find the confirmation email. My free resources can’t be accessed from this page – otherwise there would be no incentive for subscribers to confirm their email address. Once your custom thank you page you will need to add the URL to your email provider so that subscribers are directed to the page rather than being sent an email. List building tools (which I’ll talk about later on) will also require that you add a thank you page URL. Ultimately, this works better than just sending a thank you email because there’s no chance of it hitting anyone’s spam folder. Your confirmation page is where your subscribers will be sent after they have clicked the link in your confirmation email. It lets subscribers know the process is complete. You can allow subscribers to download your opt-in bribe; this makes sure they will get what you promised. The page can be used to setup goal tracking in Google Analytics (more on that in a moment). You will be able to set your custom confirmation page URL in your email provider. It’s very basic and to the point, the continue button takes subscribers to a special page which has access to all of my free downloads (I’m adding to them all the time). I’ll be looking to update this confirmation page in the near future, there’s potential to use encourage subscribers to follow you via social media. I’ve seen some great examples recently incorporating Google+ widgets etc. We’ll be talking about monitoring your progress and optimizing later on, if you want to be able to do this, you need to get goal tracking setup. All you need to get started is to have Google Analytics setup, along with your thank you page URL and confirmation page URL. It’s a straight forward process, but I have a tutorial you can use to guide you through the setup process; check out the tutorial. There are plenty of occasions where having a dedicated landing page for your newsletter will be useful. This should be a simple page with minimal distractions that focuses on the core benefits of what people will get out of signing up to your email list. So for example, if you’re going to be educating your subscribers, think about what your training will help your subscribers achieve. Numbers work great here. You can check out the page here but I’ll be split testing the copy and the layout so it may look different to the image. This page uses a 2 step opt-in process which has been proven to increase conversions. A button is displayed instead of a regular opt-in form, when you click on the button a popover is displayed instead. The idea behind this is that people see a button before a form and are therefore more likely to complete an action they have already started. I created the page above using LeadPages*; it’s a paid tool (starts from $37/month) that makes landing pages super quick to create. It hosts them for you, integrates well with WordPress and you get access to the HTML code to use outside of WordPress. The one limitation of LeadPages is its ability to customize templates, there are lots of templates but when you want something that’s easier to customize and you use WordPress, Thrive Leads* is a great option (read my review here). I’ve included some alternatives in this post about landing page plugins for WordPress. Or if you want to keep it basic, you could stick with your blogs original design – if you do this, it’s worth removing the sidebar to make sure there aren’t too many distractions. It’s a good idea to get a tool to create landing pages easily, I have dedicated landing pages for most of the free downloads I offer to subscribers. And you may want to do a similar thing! You need to look at your blog critically and ask yourself – what really needs to be there? Think about your goals and then consider how each element you have on your blog contributes to that goal. Twitter and Facebook widgets – these are an easy way to send people away from your site and email is far more effective at reaching people than social. 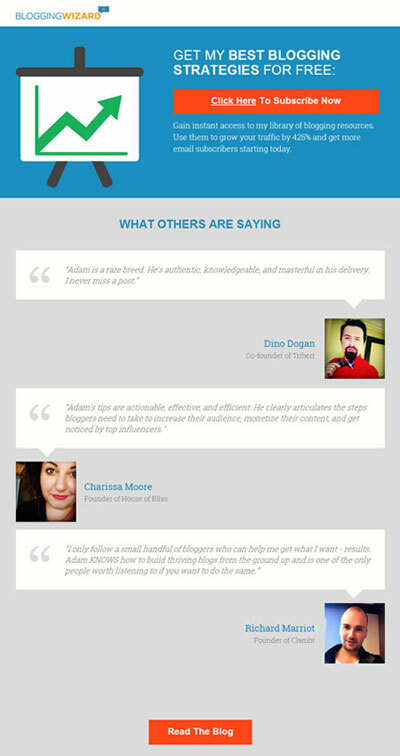 I display basic follow buttons in my footer so I can keep the focus on email subscribers. Adverts – if you rely on these keep them but if you’re only getting a few cents/click consider removing them. Blog directory links – these are usually a requirement for getting into blog directories, but if they aren’t sending you much traffic you should consider removing them. Badges – you should only use badges if they convey social proof. They should help you appear more credible. So if you’re displaying a badge that anyone can use, it’s time to remove it. Keep your blog as focused as possible and with as few different calls to action as possible. The more options you give someone (e.g. click an ad, click a social link, click another ad, click a button), the more chance they will take no action at all. Earlier I mentioned about creating a dedicated page to promote your email newsletter. Brian has worded his link to appeal directly to his target audience and what they want to learn about. This list building tactic is very under utilized but since blog commenters are involved, it can yield high conversions. There are plugins on the market that allow you to place a tick box below your comments, giving the option for commenters to subscribe to your list. AWeber Web Form Plugin – this is a free plugin but it’s limited to supporting AWeber customers. WP-Leads – again, this is a free plugin but it’s limited to MailChimp and hasn’t been updated in 2 years which makes using it risky. If you’re using the native commenting system in WordPress, you can install a plugin like Comment Redirect that will redirect first time commenters to the page of your choice. You can use this page to thank your reader for commenting and invite them to join your email list. Your home page is a huge opportunity to grow your list – are you taking advantage of it? And I’m seeing plenty more people using this as a primary list building tactic. This page is currently setup as a welcome gate so after you skip the page, you will see the regular blog layout. I’m also running a split test with a wildly different layout. I’ve used LeadPages* to create my new home page and it took around 10 minutes to build. It took longer for me to decide on a graphic to use on the page. LeadPages does start at $37/month, its worth it if you can justify spending the money. But, a more affordable option would be a WordPress plugin like Thrive Architect*. I know this is a feature within the Thesis Theme for WordPress, but I haven’t personally used the theme. Note: a similar style feature box can be achieved with Growtheme for WordPress*. You need to make it easy for people to subscribe to your email list. Adding opt-in forms to key locations on your blog is an important step that will help you here. These locations are generally where people have come to expect there to be an opt-in form, so when someone wants to subscribe to your newsletter, it’s usually these places that they first look. Right now, one of my favourite opt-in form plugins is Thrive Leads*. It supports a huge range of opt-in form types, and advanced features that most other tools don’t offer. But, there are plenty of plugins on the market that will help you to do this, so be sure to check out my post on email list building plugins for WordPress. Or our post on popover plugins for WordPress. 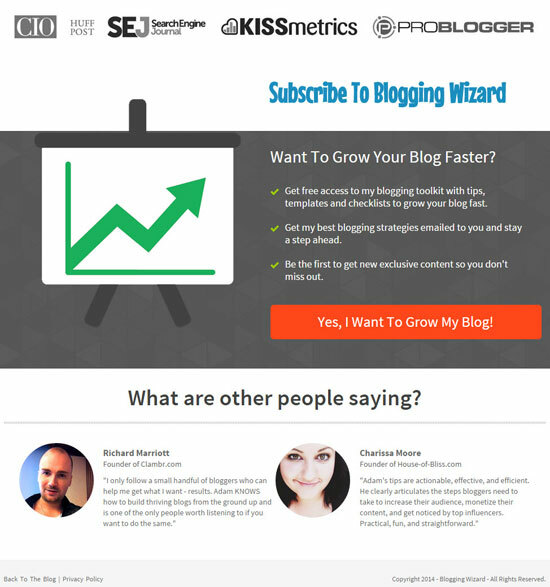 There are key pages on your blog that you can optimize to get more subscribers. Pages like your about page, start page or resources pages are great opportunities to grow your email list. For example, Pat Flynn switched to adding an opt-in form within his about page, rather than his sidebar and this boosted conversions on that page by 446%. Crazy right? All you need is to add an opt-in form within your content. This can be done by embedding a form from your email provider or you can use one of the plugins listed above which support shortcode placement. 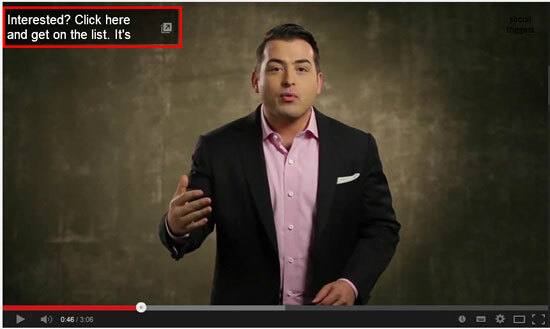 When someone visits your blog and sees a page that doesn’t work, they will see a 404 page. Most 404 pages include a message that lets the reader know something isn’t working right and usually some further information. You can use this as an opportunity to build your list. I haven’t found any other platforms that make it this easy to do this so an alternative would be to hire a developer to set this up for you. You can find a good developer using a site like oDesk. Relevance is an important part of building your email list. The more relevant that your opt-in forms and opt-in bribes are, the better your conversions will be. The key here is to display an offer that is hyper relevant to the topic that someone is reading on your site or provides the next logical step after the content they have read. This is very easy when using a tool like Thrive Leads* which allows category, page level targeting and a lot more. An alternative would be to use a plugin like Dynamic Widgets which would allow you to create different sidebar areas and choose which categories/posts they are displayed on. Trust can be an important factor for your readers when deciding whether to subscribe or not. Adding a testimonial or displaying an ‘as featured on’ logo in your opt-in form can be a great way of building trust. A great example of this is how Jeff Goins displays a comment from Seth Godin which really speaks volumes about the content that Jeff publishes. Having opt-in bribes or free stuff your readers can download is great but you need a dedicated landing page for each one that you’re giving away. Landing pages are great because they generally get VERY high conversions. Having a single page with a single goal really does work. 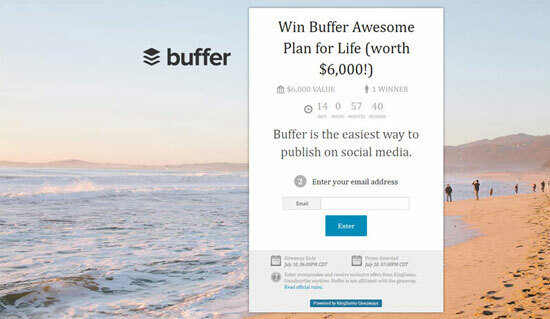 You can then drive traffic to these landing pages using calls to action on your blog, paid traffic or even using your author bio in guest posts. I’ve yet to find a free solution for creating landing pages that is worth using. Most of the ones I’ve tried come with limited templates or it takes so long to make landing pages that look good that I may as well have paid for another tool. LeadPages* – This is a platform designed to help you create landing pages fast, it takes care of the hosting and integrates with WordPress while allowing you to download HTML to use with other systems. Price starts from $37/month. I use this for most of my landing pages. Thrive Architect* – This is a WordPress plugin that allows you to create custom page/post layouts. It comes with plenty of landing pages templates and integrates with most popular email providers. Price starts at $67 for lifetime updates and 12 months support. I also covered some other alternatives in this post. Using the tools I’ve listed above, creating your own landing pages is so easy but there is still a learning curve involved and more to learn if you want to increase conversions. There’s a tonne of information on the web that can help you improve conversions but there’s one in particular that is worth going through. Check out The Landing Page Course from the great folks at Unbounce, you’ll get a step by step look at copywriting, design principals, psychology, testing and more tips to help you craft high converting landing pages. And it’s free. Earlier I mentioned Hellobar being a great option to add opt-in forms to your blog. 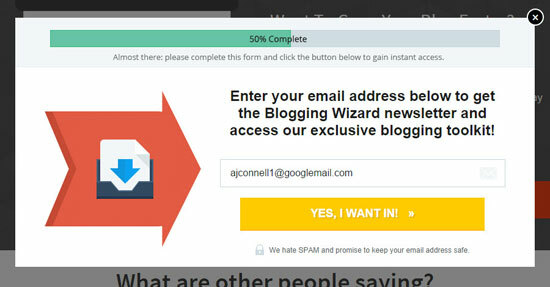 You can also use Hellobar to display targeted calls to action above your blog posts instead of opt-in forms. This provides an easy way to get traffic to your landing pages. This also works well because you can target specific pages to make sure your calls to action are hyper relevant. You can also split test with a few clicks. In this section I’ll cover specific tactics that you will want to use on a case by case basis. These can work great for getting a quick boost in subscribers. In fact, some of these tactics can often perform far better than all of your other list building efforts. This stuff is incredible. The idea behind a content upgrade is that you offer your readers a post specific bonus that is completely tailored to your blog post. 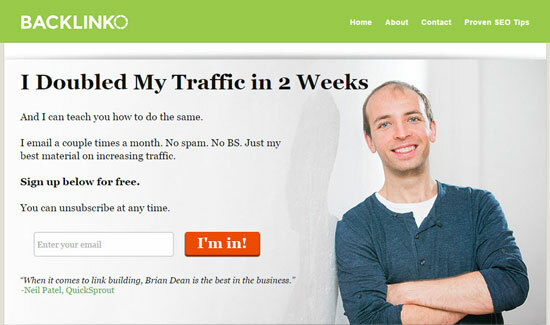 This will work better than most other techniques you have tried, Brian Dean increased his conversions by 785% by doing what I’m about to show you. This works best when used with a 2 step opt-in process, where a link is clicked and then a popover is displayed on the page. Checklist based on your post. PDF version of your post. 2 part blog post (2nd part downloadable after opt-in). There are plenty more things you could do here, but the great thing is that you have a valuable opportunity to spend slightly longer on your blog posts and repurpose them into another content type or create something 100% exclusive. If you don’t have a content upgrade ready, you could offer your readers the option to get the next post in a series which follows on from the one they are reading (H/T to Brian Dean for this idea). Needless to say, content upgrades can be tricky to offer unless you have the right tools to help you. When you have the right tools you generally avoid the technical headache that would be involved in setting something like this up with your email provider. I’ve used the LeadBoxes feature from LeadPages* to handle the clickable popover and also to deliver the content upgrade via email in the past. It’s easy to use and you don’t have to use WordPress. Since first writing this post, I’ve migrated to Thrive Leads* for this. Giving away products is a great way to build your email list. The problem is that securing a big ticket product which people would love to win can be a challenge and there are hoops to jump through. This is what Noah Kagan and the AppSumo team did differently. Instead of waiting, they put up the cost of a prize that they knew people would LOVE to win. I’m not saying you should put up something crazy like a $6,000 value prize. Think about the products in your niche that people desperately want to get their hands on and look at putting some budget aside. Before trying this, you should consider whether this will be worthwhile for you – a tactic like this makes most sense when your email list is monetized. Noah and his team built their own platform for this and it costs $198. Sure it may look a bit pricey but it works out more cost effective in the long run than similar tools that have a monthly payment attached. 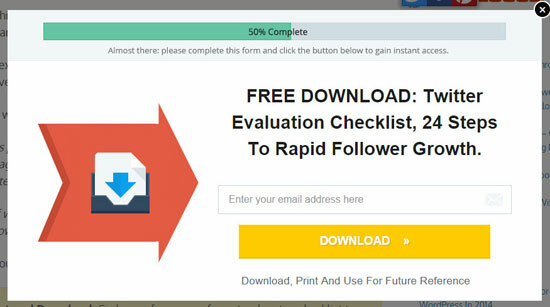 Peep Laja from ConversionXL found that by turning a simple opt-in form into a free quiz which required users to opt-in; he was able to increase conversions by around 1,900%. The above screenshot is a newer version of the opt-in form so it’s possible that conversions have been increased even more. Getting this to work for you all hinges on understanding your audience and using the quiz to answer the biggest questions your audience has. There are some great tools that offer the ability to run quizzes and build an email list, such as Thrive Quiz Builder but the opt-in form is usually presented after the quiz has been completed. Which is a good thing because you’ll likely get higher conversions when the opt-in form is presented at the end of the quiz. So, instead of the pictured example, you could present a call to action using a plugin like Thrive Leads which links directly to your quiz. Many bloggers and entrepreneurs will tell you that the moment when they launch their own product is the moment when their list skyrockets. You will always get the best results when you create something that solves a core problem that your audience is facing. The majority of these platforms will give you the option to build your list and Gumroad users can use Zapier to integrate with various email providers. Earlier I mentioned the “content upgrade” technique which has proven to get incredible results. You can make those content upgrades go further by re-purposing them into Slideshare presentations and linking back to your original blog post. Slideshare is a great way to tap into a new group of targeted readers and because the traffic you get will be highly targeted and already value what you have to say, they will be more likely to opt-in to download your content upgrade. Contributing to popular blogs within your niche is a great way to increase your authority and become visible. It can be a good way to get traffic if you contribute to the right sites. The problem is that most people miss a trick when they start guest blogging. Instead of just linking to your home page, try linking to a relevant landing page within your author bio. Conversion rates are generally high because anyone clicking on your link wants more information from you. For a more detailed breakdown of this tactic, check out this post. Paid traffic is one of the most sustainable ways to scale up your email list. I recommend that you have a way of monetizing your list in order for you to recoup the money spent on advertisements or turn it into a decent profit. Most webinars are horrible pitch fests that offer no value. Run a webinar that offers value and you will gain valuable email subscribers that will respect you more. These work well because they are time sensitive so people are compelled to sign up because they don’t want to miss out on some valuable information. In the past you used to pay insane monthly subscriptions to services like GoToWebinar but thankfully you won’t have to do that anymore. This is all down to Google+ Hangouts on Air which allow you to stream to unlimited participants. You will need another tool to help you integrate with your auto responder and give you the regular webinar features, but they are far cheaper. Check out Elna Cain’s post on how to use webinars to grow your email list like wildfire. You’ll pick up plenty of tips that will help you get started. One of the things that can sometimes stop people signing up is having to fill in their details when they sign up to your list. 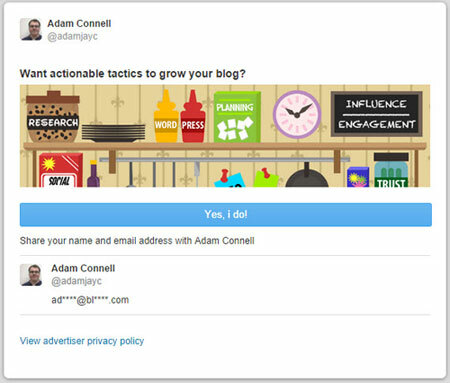 Using Twitter’s Lead Generation Cards, you will give the ability for people to sign up to your list with a single click. You can attach these Twitter Cards to any of your Tweets, but the only downside is that you have to send your tweet from with the Twitter Ads admin area. You don’t have to spend money on ads, these are completely free and you can gain more visibility by pinning a tweet with your Twitter Card to your profile page. If you’re a MailChimp user, there is a great tutorial on how to integrate the two platforms together. If you’re into video, you can use YouTube to build your list. If you’re wondering how to add links to external sites, read this tutorial which explains the process in more detail. One of the best ways to get more email subscribers is to optimize your opt-in forms and landing pages. You can also use your analytics to find which content types are performing best and which promotional channels are referring the most subscribers. You can leverage this information to grow your list. You need to split test your opt-in forms in order to figure out exactly what combination of design, copy and offer works best for your audience. Right now I’m using the Thrive Leads* to display opt-in forms and split test various tweaks. Before you start split testing you should consider what you think could improve conversions and then test it out. Starting off with a hypothesis is the best way to go. Often minor tweaks can result in decent conversion increases; I’ve found that just changing one element of the design like a button colour can yield significant results. Ultimately it comes down to what you are offering your readers and how that offer is framed, the more relevant and the higher the perceived value the better. We’ve talked a lot about landing pages. They work well because they are hyper focused and generally speaking most traffic generation methods result in highly targeted visitors. They will convert well if the design, copy and offer is up to scratch but you can always optimize them further. Similar to what I mentioned for optimizing your opt-in forms, you will need to come up with an initial hypothesis of what you think could improve conversions. Test it and see how it works. Remember that best practice will give you a head start but different audiences can react in various ways to the exact same thing. I use LeadPages* for the majority of my landing pages, it has split testing built in which allows you to setup a split test in a few clicks. The split testing feature requires a pro account which starts at $67/month. To me, this is worthwhile because LeadPages doesn’t limit the number of monthly visitors, I can create landing pages fast and there’s the LeadBox feature for content upgrades which I mentioned earlier. A free option would be using the Content Experiments feature with Google Analytics. While it is free, it’s more time consuming to setup. You could also use a tool called Optimizely, pricing starts from $19/month for 2,000 monthly visitors. You can import your pages and tweak them right from within the platform. In order to grow your email list (or improve your marketing in general) is to find what works and do more of it. A great way of doing this is finding which of your traffic sources are delivering the highest conversion rates. For example, I find that visitors coming from relevant sites in my niche convert better than search engine traffic or even social media traffic. That’s just me; it could be radically different for you. So, how do you find this out? Earlier in this post I talked about setting up goal tracking in Google Analytics – this will allow you to identify which traffic sources convert the best. How to do this: click on ‘acquisition’ and then click ‘channels’. When you look at your referrals, you can find out exactly which sites are sending you traffic. So, if you’ve written a guest post for a particular site and notice an influx of conversions, it’s safe to say that it’s worth contributing there again. Similarly you can identify which blog’s aren’t sending you any traffic or subscribers – it’s a good thing to know because you should always look to prioritize your efforts. Phew! Thanks for making it this far. By now you should have plenty of ideas you can use to grow your email list. Once a subscriber joins your email list, that’s when the real email marketing starts. But that’s more for another time. For now, work your way through this post step by step and start getting more subscribers. You can do it!